Last week I helped out with a big conversation for 250 consultants belonging to a global practice. The agenda was.... blank. Literally, there was no agenda. Is that a recipe for chaos or what? Well yes it is chaotic - but not in the headless chicken sense. My good friend http://www.johnniemoore.com added just enough structure to make the whole thing swing. First off gather everybody together and ask them what they want to talk about. Issues get written on a flipchart and presented to all by the originator for 1 minute max. We got about 10 offers for conversations. Johnnie then goes through the offers and asks for a show of hands for each. There are no constraints on issues to talk about - no holds barred. If a subject is poor, no one will want to talk about it. Once everyone knows which conversation they're going to join, the group splits up and starts talking, each conversation facilitated by the originator. Notes are kept by a volunteer. People are encouraged to leave a conversation whenever they want, join another or sit on their own. After an hour or so, we return to plenary and the floor is opened to comment and feedback. The whole thing rests on a fine balance between structure and chaos. By way of explanation, Foolery (sub-title of this blog) is not meant to carry just the derogatory sense associated with the word fool. 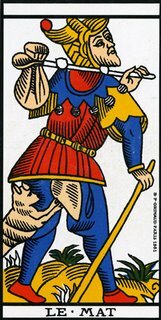 In fact I quite like the double-edged, paradox of the wise fool - the person with little intellectual baggage but plenty of sense. With the timerity to ask stupid questions that have surprising answers. The person that is oblivious to what others might think of him/her - how refreshing is that? I like the symbology of the dog in the picture. He doesn't judge his master - the relationship is purely emotional. There's little history and no future here - just presence. I think we need more of this spirit in our culture - especially in our organisations that over-structure in a futile attempt to make existence predictable - now that is foolish. My professional body has changed its name and is recruiting a new CEO. Good idea - time for a change. A friend of mine got rather upset when he was rejected on the basis of having no previous experience in this kind of role. Astounded that an organisation purporting to embrace change could cut itself off from the most likely source of inspiration and innovation, I got on the warpath only to discover that he'd been fobbed off with a manufactured reason. We'll probably never get to the bottom of this, but I'm assured by a member of the recruitment team that 'no previous' is not an obstacle to selection as the new CEO and that several shortlisted candidates fit this profile. All fine and dandy you might think. Well, not really. In all of this I discovered that the recruitment process is absolutely bog standard. That means that an agency compares CVs to the job spec and reduces the pile by 90%. No surprises there then - that's what all agencies do, right? Yes, and the result is that 90% are rejected on the basis of how they write a CV - not on the passion, creativity, energy and vision that the organisation needs. How do you get that into a 2 page post-mortem of your career?